Click here for audio of Episode 774. Today, a story about a hole in a stomach -- and opportunity. The University of Houston's College of Engineering presents this series about the machines that make our civilization run, and the people whose ingenuity created them. Fort Mackinac, June 22, 1822, in what is now Michigan: A nineteen-year-old French Canadian trapper, Alexis St. Martin, stands on the threshold of history. Actually, he stands in the American Fur Company store. Suddenly, a shotgun goes off by accident. The gun was 2½ feet from St. Martin's chest. Duck shot shredded his ribs, lungs, diaphragm, and stomach. 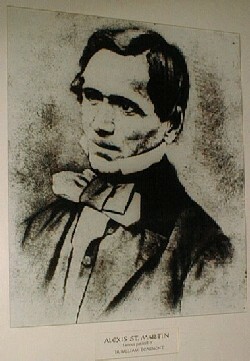 The post surgeon, William Beaumont, came on the double. Beaumont sifted out bone fragments, patches of burned clothing -- shredded tissue. Finally he gave the ruined St. Martin 36 hours to live. But St. Martin rallied. For two years Beaumont tended him. Then he hired him as a handyman. The ghastly wound healed. Well, it almost healed. The breach in St. Martin wouldn't quite close. Skin healed around a patch of exposed stomach wall. The torn stomach, in turn, formed a kind of mouth. It healed into a valve that opened when St. Martin ate too much. Some ... will have it that the stomach is a mill, others that it is a fermenting vat, others again that it is a stew pot. In 1825 Beaumont realized he'd been handed a remarkable opportunity. He made a deal with St. Martin and began a series of observations. He peered into St. Martin to see what his stomach was doing after different meals. He subjected samples of gastric juices to chemical analysis. Early in 1826, St. Martin wearied of the game and walked off. A few years later, Beaumont tracked him down in Canada. St. Martin -- now married and the father of two -- knew his value to Beaumont. He dickered for price. Finally, in 1829, Beaumont rehired him, and his family, so he could continue the tests. Beaumont published a book in 1833: Experiments and Observations on the Gastric Juice and the Physiology of Digestion. It was clean, accurate scientific work. (Click here for a page from the book showing the wound.) Beaumont set the basis for what we know about digestion today. The book had a powerful influence back in the medical centers of Europe. And St. Martin? Well, he lived to 83. Long after Beaumont died, he was still showing himself at medical schools for pay. So maybe this is a story about opportunism. After all, both Beaumont and St. Martin grasped the occasion in different ways. But Beaumont had the wit to see opportunity -- to use it for the general good. And if you've ever been cured of a stomach problem -- you should be very thankful he did. Beaumont, W., Experiments and Observations on the Gastric Juice and the Physiology of Digestion . (Sir William Osler, ed.,) New York: Dover Publications, Inc., 1959. White, J.I., American Vignettes: A Collection of Footnotes to History . Convent Station, N.J.: Travel Vision, 1976, pp. 24-26. I'm grateful to Laura Douglas, Gammage's Bookstore in Houston, for calling my attention to Beaumont's story. Photo by John Lienhard of a drawing in the Cushing-Whitney Medical Library, Yale University.